I offer uniquely designed meditation and wellness support for groups and organizations. Options include regular group sessions, a half or full-day workshop, a short presentation, or a longer retreat. In addition to private venues, I have presented at local community centers, universities, libraries, healthcare organizations, community colleges, and nonprofits. If you’d like a free initial assessment for your group, please email info@juliaaziz.com or call 512-827-8208. If you are in the Austin area, I invite you to join me at our free, weekly Community Wellness Hour. 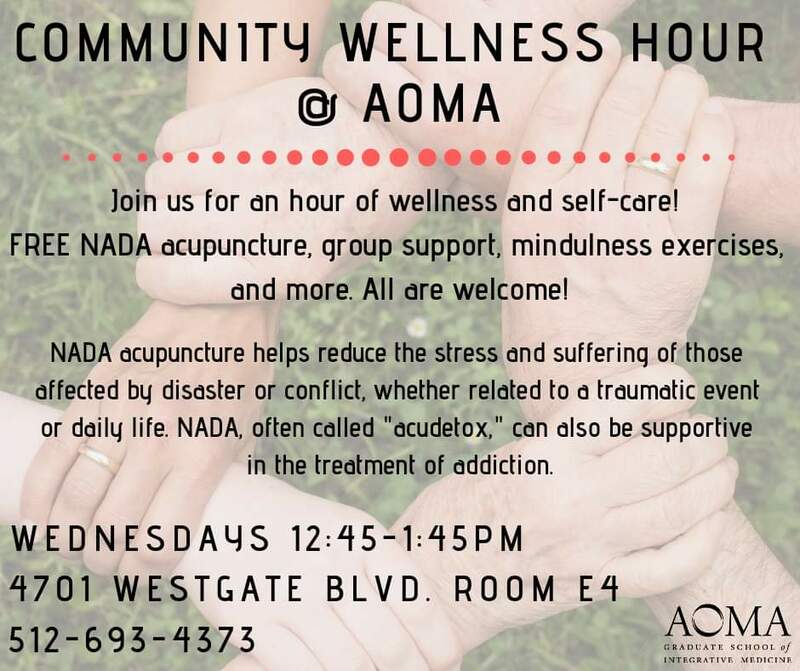 Community Wellness Hour takes place every Wednesday from 12:45-1:45pm at AOMA Graduate School of Integrative Medicine and includes NADA acupuncture, guided meditation, and community sharing. For updates on other upcoming events, please sign up for my newsletter. Julia is a highly spiritual and open-hearted facilitator and teacher. She has a gift for holding a safe space, structuring without rigidity or judgment, and presenting highly inclusive invitations for personal exploration. I would recommend her workshops and retreats both to helping professionals and the general public. I feel refreshed and energized. I am thankful for Julia’s lovely presence and helpful guidance. Her quiet acceptance allowed us to be at ease as we moved into each part of the program. I am very grateful. This workshop gave me great insight into myself. Julia is a wonderful facilitator. Very safe and relaxing. I am walking away from this renewed in my self-confidence.